Historical patterns suggest that democratic governments, which often fight wars against authoritarian regimes, maintain peaceful relationships with other governments that uphold political freedoms and empower their civil societies—a concept known as “democratic peace.” Democratic Peace in Theory and Practice is a timely collection of essays by leading scholars that examines how democracies maintain relationships and how democracies are spread throughout the world. 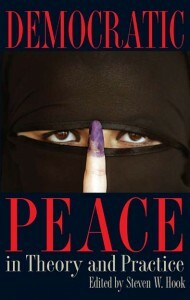 Along with two articles by Michael W. Doyle that brought widespread attention to the concept of democratic peace in the 1980s, the essays in this volume explore the application of democratic peace theory in the Middle East, the importance of peace and prosperity in developing democracy, the contradiction between democracy and capitalism present today in the process of globalization, and democratization in Africa. The contributors also consider the contradictions of promoting democracy by force, the necessity of educating and mobilizing citizens in democratic countries, economic sanctions as policy tools, and the relationship between democracy promotion and terrorism, among other topics. The latest volume in The Kent State University Press’s Symposia on Democracy series, Democratic Peace in Theory and Practice will be welcomed by political scientists and valued by students of democracy, diplomacy, and peace studies.